Gallery of Scrimshaw Jewelry, Wedding Bands, Nautical Accessories. This is as classically-shaped a right-handed Sperm Whale's tooth as you are likely to ever find. 6 inches along its curve, 2 inches wide at the base and weighing 163 grams. On this tooth is depicted the portrait of a British Third Rate Ship-of-the-Line. In 1805, the time of the battle of Trafalgar, Third-Raters made up 147 of the total of 175 British Ships-of-the-Line. These three-deckers carried up to 80 cannon, and numbered about 700 men. The function of the third-raters was to fight in the great naval fleet engagements. These fighting ships could deliver up to 25 tons of shot every hour! This tooth is precisely etched with such a ship, with her gun ports open and cannon ready. She is preparing for battle under moderate sail. The hull is lightly colored in brown and yellow. [Please click on the picture for a larger view.] The back of the tooth is left unpolished, so you can feel its natural state. Choose, as an added option, a Sterling Silver display stand made specifically for this tooth, which allows you to remove the tooth for closer viewing, and replace it when you are done. Also available is a turned walnut wood stand. This is, of course, a real and legal tooth, registered with the U.S. Department of Commerce as #21-145. 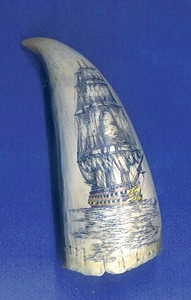 This is an exquisite piece that any scrimshaw collector would be pleased to highlight his collection. Can be shipped only within the United States. A chance to own a signed original by American scrimshander M.M. Cohen. A unique piece - Of course, only one is available. Every piece complies with the regulations associated with the Endangered Species Act, the Marine Mammal Protection Act, and Maryland state environmental and ecological laws. All of our designs are original and copyrighted. Copyright © 2016 Ancient Ivories Studios. All rights reserved.